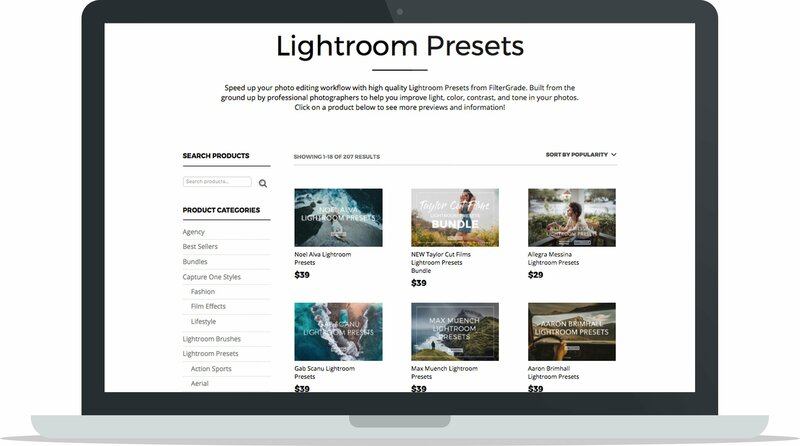 In this case study, you’ll learn how FilterGrade built their brand over the course of three years into a successful marketplace selling digital assets like Photoshop actions and Lightroom Presets to photographers, designers and bloggers. Learn how they sell products their customers can’t touch or feel, the importance and impact branding has had on their business, that they didn’t even have an audience to launch to when they started, and how they’ve grown into a marketplace featuring the work of other creators over time. Dig into this case study to learn more about FilterGrade. What do you sell in your own words? 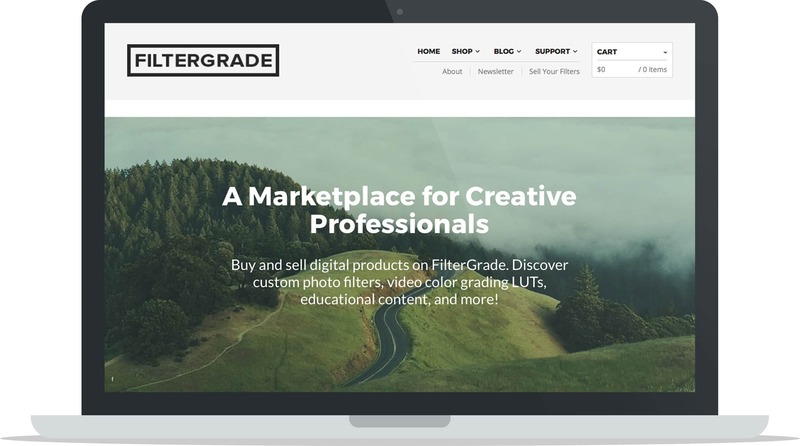 FilterGrade is a marketplace for creative people and entrepreneurs. We help photographers, graphic designers, videographers, and other creative individuals sell their digital assets. 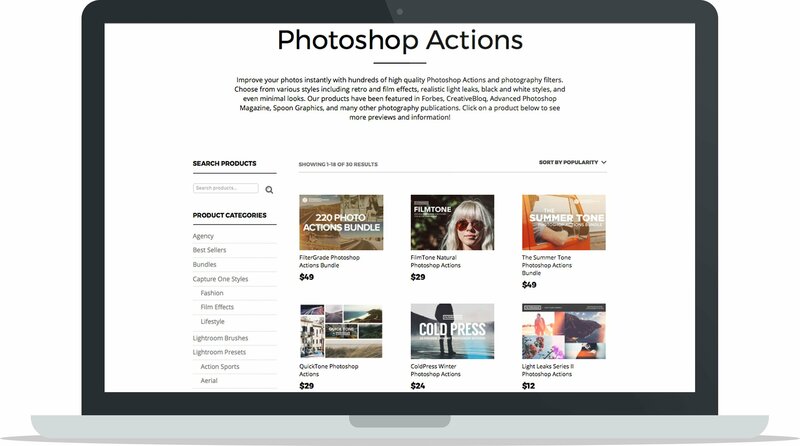 How did you know there was a demand for Photoshop actions, Lightroom Presets and other photo editing resources? Did you do any market testing or was FilterGrade created to solve your own needs? I noticed a few trends. Photography becoming more prevalent, a focus on editing, and a demand for high quality filters that people and companies could use in their branding/promotions. I did a little bit of market testing, wrote a whole lot more about that here: Using Marketplaces to Build an MVP. You appeal to a few distinct niches: photographers, designers and bloggers. How do you ensure your products are relevant to their varied needs? I try to spend as much time talking to customers, supporters, and other members of the FilterGrade Community as I can. I also listen to some of the haters too. Through all this feedback I am able to see what we are doing well, what we are doing poorly, and how I can best serve our customers in each of these niches. Listening to what people are saying on social media (Twitter, Instagram, Facebook) has helped a lot! Did you consciously decide to sell digital products, or did it just so happen that your products are digital? Just sort of happened this way. I am a huge fan of software though and love working with technology to help create fun and exciting experiences for people. How has your experience been selling digital products? Would you ever sell physical products? Selling digital products is very challenging, but in a good way. I enjoy it a lot. I definitely would like to sell and work with physical products, but I have much to learn in that space! What advantages and disadvantages have you faced selling digital products? 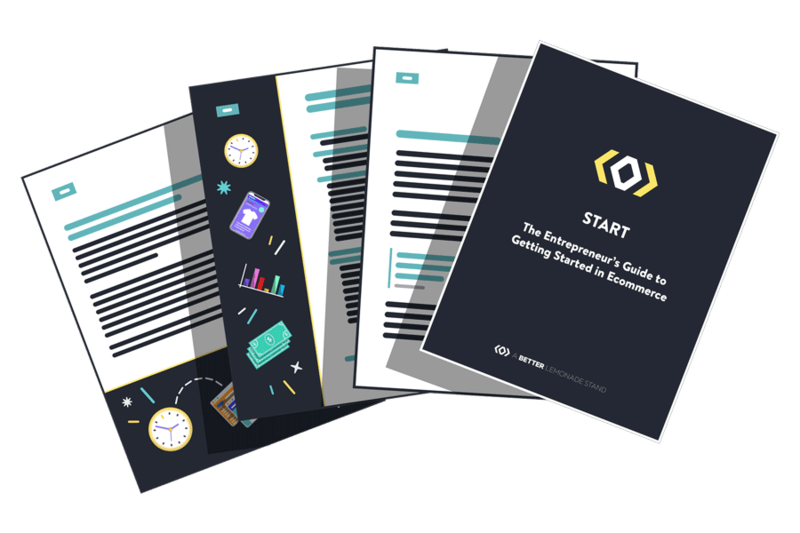 The biggest advantage to selling digital products I’ve faced was the ability to enter the market without a ton of money invested in product development. Having the skills to create these filters made it a good project for me. The biggest disadvantage to selling digital products I’ve faced is copyright infringement and lack of support from banks. Many banks will not defend or help protect digital creators and I wish they would do more to help us. How have you managed to stand out from competitors who also sell digital photography actions and presets? We’ve always tried to focus on building FilterGrade as a large community and brand, not just a shop. Through engaging and exciting content, partnerships, and our expansion into a marketplace we have been able to help grow FilterGrade and build a large community for creative entrepreneurs. You sell your products on FilterGrade as well as on Creative Market. How has selling on a marketplace as well as on your own store been beneficial for you? Have there been any disadvantages? I am a huge fan of CreativeMarket. The amazing team there, especially Aaron, have always supported the design world and I am forever thankful for their support of me as well. Selling on Creative Market helps us reach a larger audience and get valuable feedback on our work. Currently, I have not had any disadvantages. Not only do you sell your own actions and presets, but you allow other people to sell their filters on FilterGrade as well. How is this beneficial for you? Did you start this partner program to build your library of filters or to help promote other people’s work? 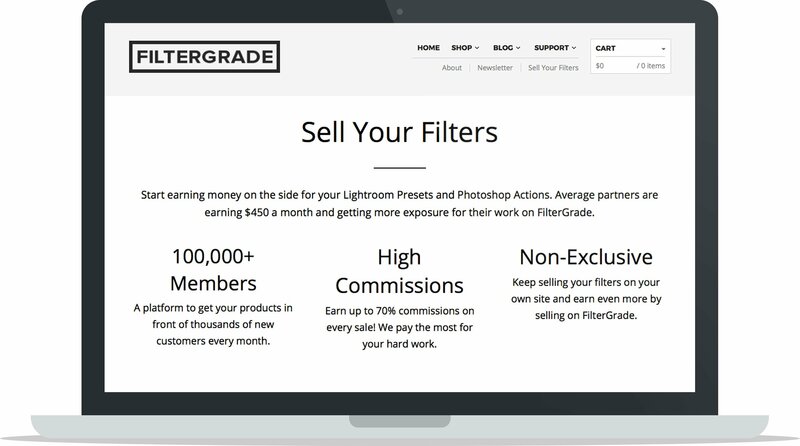 By allowing other people to sell their filters and digital assets on FilterGrade we have been able to expand the site quite a bit and attract a much larger audience. We started this program for a number of reasons. First and foremost was demand. Hundreds of people email us each month asking for filters from certain people, brands, and creators. We also did this to expand our library as you mentioned and to help promote the work of the amazing partners we work with. In the future, we are excited to build more tools that help our partners grow their brand and support themselves. More on that in late 2017! When I started FilterGrade, I had no audience. Aside from a few existing relationships in the design world, I didn’t have much to go on so I just started the site and went from there. Honestly the labels and folders in Gmail help me so much. I use this to help with customer support, product feedback/demand, partner relations, partner outreach, and so much more. I also find Evernote and Google Drive incredibly useful in day to day operations. What core tools or resources have you used to build your business that you wholeheartedly recommend? There are a lot of great tools that have helped us build FilterGrade. WordPress and other products by Automattic, MailChimp, Conversio, AdRoll, and SumoMe have all been really useful to us. Which ecommerce platform do you sell your digital products on and why? Right now, we use WooCommerce to power FilterGrade. It is really well built and has a lot of powerful integrations that help us best serve both our customers and our partners on the marketplace. How do you promote products that customers will never be able to touch or feel? With digital products there’s no physical unboxing experience, so how do you make your customers engage with their purchases? With our filters we try to do our best to show a lot of previews and clearly explain what you’re getting. Sometimes, we also create videos to show a more in-depth look at the product. Finally, we work to make the experience from discovery to purchase to download to installation fun, easy, and efficient so our customers can spend more time editing and sharing their gorgeous photos and designs. How did you approach your marketing strategy? What did you do to make FilterGrade known to your niche market? Content has always been the biggest focal point of our marketing strategy. By creating valuable and intriguing content we are able to reach more people in our market, and in other related niches as well. Also, by focusing on the brand behind FilterGrade from the start we were able to make ourselves more known in the industry and more easily recognizable. We find the most success marketing and promoting our products through social media, influencer relationships, and email. We made our first 10 sales through the blog on our website. Having 7-10 solid articles helped attract enough traffic and attention to drive those first few sales. We made our first 100 sales by learning email marketing. Sending emails about new products, freebies, and blog posts helped us drive those next 100 sales. In early 2016, we attempted to build a monthly subscription service with exclusive filters and educational content from FilterGrade. Due to poor planning and weak execution, this failed miserably. Hopefully in the future, we’ll be able to give this another try. 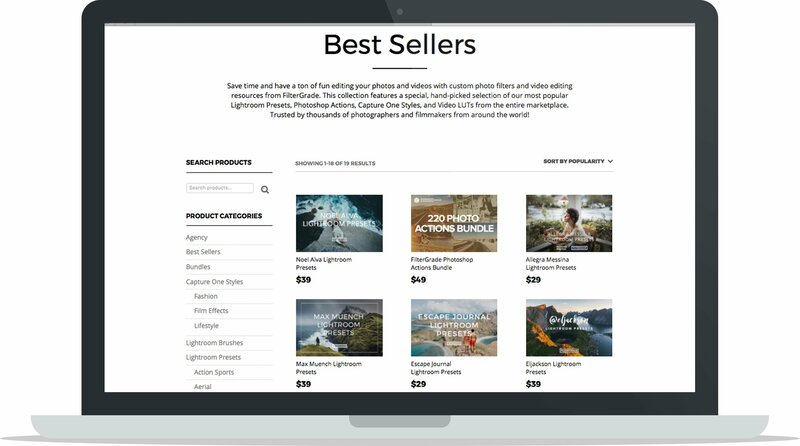 Expanding FilterGrade into a marketplace where other talented creators can buy and sell their products has helped us grow the most. It is really nice being able to meet and work with such amazing people through this platform. Stay focused. Lack of focus kills most companies before they have a chance to shine. The best advice I was given in regards to business basically was to practice empathy and remember that there are people behind every product/service you use. It is important to show respect and compassion in the work that you do and above all work to help others as much as you can. This has helped me the most in my career. In 2017, our goal is to work with more partners and build better tools to help support their work. If you’re looking for a number goal, we are working hard to help 500 partners sell their products on our marketplace by 2018.